Are you ready for Chocolate Overload? Here is the report on our Chocolate-themed gourmet group dinner, this year. These are the invitations I created. I purchased the Belgian Chocolate Bars from Fresh & Easy (Will they twitter about me again?) and wrapped them in gold tissue paper. Then I made wrappers out of the various brown scrapbook papers I had at home. I designed the label that is used through out the dinner with digital elements by Anne Langpap at 2peas (main font is Selfish). I wish I could have bought labels that shape. As it was, I let my 7 year old help me cut things out, so they weren’t exactly perfect. On the back of the bar I attached the Nutrition Label I created digitally. I wrote “best if eaten on-Feb. 28th, at 7:00pm”, and put the address of the dinner as the place where the chocolate was manufactured. Maybe I made it look too realistic, because some of my guests said that their family members helped consume the chocolate and didn’t save the wrapper with the information. At least I know they were all excited to get the invitation. After making those, I saw this fun idea (wouldn’t have helped with retaining the information, either), and I intended to use this concept to make labels for the appetizers, but ran out of time for that detail. I was in charge of all of the pretty stuff, and my partner, Tina, did the bulk of the recipe finding and cooking (with a few important exceptions), and she let us have the dinner at her fantastic home (which I am planning to blog about one of these days soon!). We set up the dinner on her back patio (yes, we are in Arizona!). I had a different color scheme in mind until I saw the Godiva Chocolate room, and knew that the brown and gold would give the feeling of rich decadence I was going for. 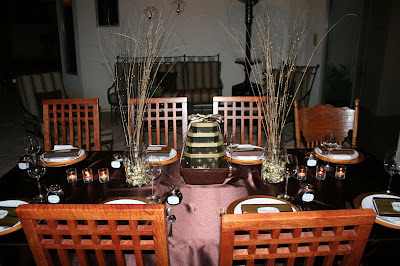 The chocolate brown table cloth is a poly satin fabric I bought at Hobby Lobby for 2.99/yd. I also bought the fusible tape to do the hem, so that it was a no sewing project. I also skipped the hemming and piled up the remainder of the fabric in the center of the appetizer table. The tall centerpieces are large jars filled with “Christmas Ting” I picked up at my Fry’s grocery store, with gold foil Hershey’s kisses as filler (I wish I had bought one or two bags more). I was inspired by the vases at this High School Musical party. The centerpiece in the middle of the table are the empty gift boxes that were full of goodies and given my Father-in-law (a doctor) at Christmas time. We made these recipe booklets that kind of served as menus. I designed them to resemble a box of chocolate, and placed them directly on the plates, to break-up all the white from the plates and napkins. I piped everyone’s names in chocolate on wax paper, and then peeled off the hardened chocolate and placed them on the gold chargers to serve as place cards. (If you attempt this, use a thin spatula to remove the name since they are fragile and break easily). This chocolate body scrub was the favor. I found the cute jars at IKEA, and printed corresponding labels. Label reads: WARNINGS: Body scrub may make shower floor slippery. Chocolate scent may make user very hungry for dessert. Here is the cake table. More about that later. Chocolate scented ball candles from IKEA. I didn’t get great pictures of all of the food, but here are a few. These are the Virgin Chocolate Martinis (recipe here). These cute glasses are from IKEA (about $4 for 6, I think). And yes, I know they are not officially martini glasses, but this drink was rich enough that we could only handle small doses, anyway, so I think they were perfect! 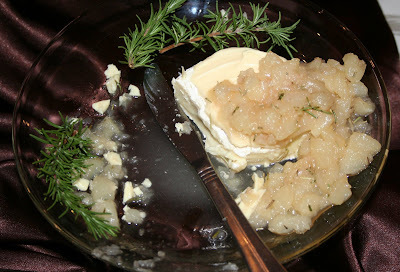 Other appetizers included this White Chocolate Camembert with Rosemary Pear Chutney(yummy—and half eaten in this picture). Toast with Chocolate and Fleur de Sel, and Chocolate Covered Grapes. We served a yummy Green Apple/White Chocolate Salad with Balsamic Vinaigrette. We used these recipes for the main course. The chocolate sauce on the meat, really wasn’t very sweet. We also served Ranch Style Shrimp With Bacon, this course. It was so yummy! Every dish, except the couscous was made with some sort of chocolate, and we served the shrimp on top of the couscous, so I’m sure it had some chocolate from that BBQ sauce. I’m going to call this cake creation a Chocolate Orange Ganache Layer Cake. There is no recipe to link, because it is a Barry creation, based on a flowerless chocolate cake recipe layered with regular cake and ganache and whatever other flavors we are in the mood for. I may get Barry to do a post about it. I helped this time, frosting the cake with ganache, and experimenting with chocolate transfer sheets. (I bought mine here). You use a tempered chocolate, or a chocolate meant for candy dipping, and spread a thin layer of chocolate on the transfer sheet. It “transfers” the edible design onto the chocolate. Our design had gold flecks. I’m going to say that we were going for this kind of rustic, messy presentation, and you’re going to try and believe me, right? I think it will take a little more practice to master working with chocolate like this, but it’s a lot of fun to think about the possibilities! I think the evening was an overwhelming success. The trick in planning a dinner like this, is to make the chocolate subtle enough that guests aren’t sick to their stomachs before the main course. We also varied recipes with dark chocolate, milk chocolate, and white chocolate (which technically isn’t chocolate at all, but for our purpose, fit the bill). Of course, we killed them with chocolate in the dessert, but also provided paper plates for them to take home whatever cake they couldn’t eat finish there. It was fun to explore chocolate in some savory recipes, and discover new uses for it. Maybe next time we’ll get brave enough to try chocolate covered bacon. OH my goodness!! This is amazing! I LOVE chocolate. I have always wanted to do a chocolate party…now I have ideas!!! 🙂 Thank you for sharing this wonderful party. What a great party! I love the table cloth, I’m going to have to make a trip to Hobby Lobby for some fabric! I am a chocolate lover and you have some great ideas. I love the names that you piped for the plates. Great post!! Wow – what an amazing, wonderful presentation! It is all so beautiful! I love the table, decorations, favors. And the food — it looks so scrumptious!!!! Anything with Chocolate in the title is a winner with me! Those labels and candy bars are awesome! Omgosh! I am just floored at how down to the details creative brilliance this party idea is!! When reading this post I was looking at the The Virgin Chocolate Martinis. Looks pretty yummy! I would like to try it. Oh wow! You are so talented and I have loved reading through all of your posts. Do you mind if I post a few on my blog and link back to you? Great job! What a yummy looking party! I wish i was as talented as u do you mind if i link this to my website? I still can’t get over the looks of all the food!